Find the right tour for you through Angkor Wat. 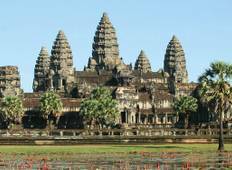 We've got 305 tours going to Angkor Wat, starting from just 3 days in length, and the longest tour is 134 days. The most popular month to go is November, which has the most number of tour departures. "Amazing and personal tour! Our tour guide vanak was so knowledgeable personable and..."
"The tour was amazing, but honestly what made the whole experience an unforgettable..."
"The Tru Cambodia Explorer tour is the first trip I’ve ever taken outside of Europe..."
"Fantastic tour !! Amazing guide, fantastic food, incredible sights. Great balance..."